Spring is here! And so is the dreaded hay fever. Here at The Ark we love using a range of natural approaches to preventing or treating hay fever, and two of our favourite solutions are local honey and bee pollen. Consuming local honey can work to desensitise your system to the effects of local pollen, while bee pollen can work to reduce histamine in the body in a much healthier way than many over the counter antihistamines, while providing a wealth of proteins, amino acids and vitamins. 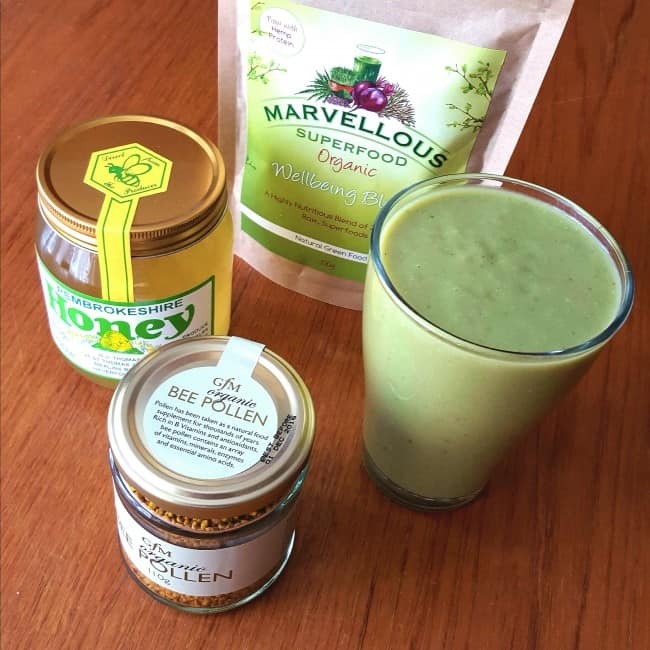 We love combining the two with a scoop of Marvellous Superfood Organic Wellbeing Blend (a wonderful green powder which blends together seven organic raw superfoods) in this gorgeous green smoothie to help keep us healthy at this time of year. We hope you enjoy this recipe, and don’t forget to let us know if you give it a try! Start by blending together the kale and water, then add the other ingredients one at a time and blend until smooth. Enjoy!